Image caption Raising a glass to the findings of the Danish study? Drinking three to four times a week has been linked to a lower risk of type 2 diabetes than never drinking, Danish researchers suggest. Wine appears to be particularly beneficial, probably as it plays a role in helping to manage blood sugar, the study, published in Diabetologia, says. They surveyed more than 70,000 people on their alcohol intake - how much and how often they drank. But experts said this wasn't a "green light" to drink more than recommended. And Public Health England warned that consuming alcohol contributed to a vast number of other serious diseases, including some cancers, heart and liver disease. "People should keep this in mind when thinking about how much they drink," a spokeswoman said. Prof Janne Tolstrup, from the National Institute of Public Health of the University of Southern Denmark, who led the research, said: "We found that drinking frequency has an independent effect from the amount of alcohol taken. "We can see it's a better effect to drink the alcohol in four portions rather than all at once." After around five years, study participants were followed up and a total of 859 men and 887 women group had developed diabetes - either type 1 or the more common type 2. The researchers concluded that drinking moderately three to four times a week was linked to a 32% reduced risk of diabetes in women, and 27% in men, compared with people drinking on less than one day a week. Findings also suggest that not all types of alcohol had the same effect. Wine appeared to be particularly beneficial because polyphenols, particularly in red wine, play a role in helping to manage blood sugar. When it came to drinking beer, men having one to six beers a week lowered their risk of diabetes by 21%, compared to men who drank less than one beer a week - but there was no impact on women's risk. Meanwhile, a high intake of spirits among women seemed to significantly increase their risk of diabetes - but there was no effect in men. Unlike other studies, this research did not find a link between binge drinking and diabetes. Prof Tolstrup said this could be down to the small number of participants that reported binge drinking, which was defined as drinking five drinks or more on one occasion. Dr Emily Burns, head of research communications at Diabetes UK, said people needed to be wary as "the impact of regular alcohol consumption on the risk of type 2 will be different from one person to the next". While the findings were interesting she said they "wouldn't recommend people see them as a green light to drink in excess of the existing NHS guidelines". That advice suggests that men and women should drink no more than 14 units of alcohol a week - equivalent to six pints of average strength beer or 10 small glasses of low strength wine - over the course of three days or more, with some days being alcohol-free. Rosanna O'Connor, director of drugs, alcohol and tobacco at Public Health England, said: "It is not helpful to talk about the effect of alcohol consumption on diabetes alone. "Consuming alcohol contributes to a vast number of other serious diseases, including some cancers, heart disease and liver disease, so people should keep this in mind when thinking about how much they drink." Prof Tolstrup and her team have used the same survey to research the effect of alcohol on other conditions. 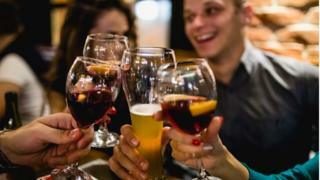 They found that drinking moderately a few times a week was linked to a lower risk of cardiovascular disorders, such as heart attack and stroke. But consuming any amount of alcohol increased the risk of developing gastrointestinal diseases, such as alcohol liver disease and pancreatitis. Prof Tolstrup added: "Alcohol is associated with 50 different conditions, so we're not saying 'go ahead and drink alcohol'." Update 7 September 2017: This article has been updated to clarify that while Danish researchers found no causal relationship between drinking and the risk of developing type 2 diabetes, they did find that those who drink three to four times a week are less likely than those who never drink to develop diabetes.